First released in 2015, From Software’s Bloodborne was a massive hit for the developer and PlayStation for whom it was an exclusive title. Given the game’s success and continued calls from fans for a sequel we don’t think it’s entirely unlikely that Bloodborne 2 will be announced eventually. That said, it hasn’t been done just yet. That hasn’t stopped theories and rumors from circulating – especially after a certain mysterious From Software trailer made an appearance at the 2017 Game Awards. We’ve gathered all the latest news and rumors surrounding Bloodborne 2 for your perusal, along with some of our hopes and dreams for the sequel. If it ever happens, of course. It’d be kind of hard to determine a release date for Bloodborne 2 given we don’t even know if it’s happening yet. That said, the original game was released in 2015 so a release within the next year or two would strike a good balance between a reasonably long development cycle and not allowing fans to lose hope or interest. Is it being teased by From Software? While there’s always been some hope from fans that a Bloodborne 2 would be released eventually, it was a trailer released by From Software at the Game Awards in 2017 that really made fans go wild. The very short trailer, which you can watch below, is extremely mysterious. And pretty gross. It doesn’t give any kind of title away but it does have the tagline “shadows die twice.” Between the gore and the mystery this trailer certainly smacks of Bloodborne. That said, it's not guaranteed and there are many who believe it could just as easily mark the revival of the Tenchu series because there’s a distinctly Eastern theme to the trailer and in the background there’s a script that looks like it could be written in some kind of Japanese script. While it's true that the Eastern theme shown in the Game Awards trailer wouldn’t fit in with the pseudo Victorian Yarnham of the original Bloodborne. However, if Bloodborne 2 were to be set in an entirely new location it could work. Many players point to the character Yamamura the Wanderer from the original Bloodborne as an indication that the next game might move to a more Eastern setting. Yamaura can be found in a cell at The Hunter’s Nightmare and the player can call on him as an ally. What makes Yamamura interesting is that he’s dressed in clothing that shows he’s from a different land. Many are using Yamamura’s appearance as evidence that Bloodborne 2 is coming and that it’ll take place in this distant Eastern land where he came from. This isn’t without precedent, of course. It’s also believed that Miyazaki hinted at Bloodborne’s setting in Dark Souls through the NPC Marvelous Chester, whose dress and manner are reminiscent of the Victorian Gothic Yarnham. All the way back in September 2016 From Software president and Dark Souls creator Hidetaka Miyazaki confirmed that the studio is currently developing three games in an interview with IGN at the Tokyo Game Show. Now, one of these is definitely Armored Core, but that still leaves two games in the pipeline. “So there are several titles that we are currently working on [...] Some of those are dark fantasy, some of those could be a mech [game] - that's one thing. The second thing is that one of the new titles I've been working on will probably comply with the expectations from the fans in straightforward manner. It’s the talk of a game that “will probably comply with the expectations from the fans in a straightforward manner” that has us really interested. 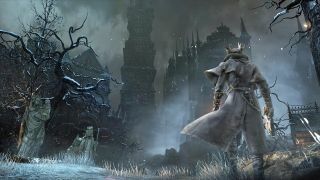 The Bloodborne community is rather divided when it comes to seeing the need for a sequel but there are a large number of fans who want to see Bloodborne 2 happen in some form or another. In fact, many simply see it as an inevitability. Certainly, it’s the game most would hazard a guess at if From Software said they were working on a sequel for a game. Though Miyazaki went no further to confirming that one of the games From Software is working on is Bloodborne 2, we think it’s certainly a strong candidate. Aside from the obvious fact that what we want to see most out of Bloodborne 2 is, well, Bloodborne 2, we do have some other wishes. Here’s the thing about Bloodborne 2 – we don’t just want to play the original Bloodborne all over again. While we’d love the mechanics and overarching Lovecraftian themes to remain, we’d love to see it take place in an entirely new setting that breaks away from that Victorian gothic look. The rumors that the game might be moving to a more eastern setting would be more than enough for us in this sense. Not only would it add a fresh aesthetic, it would let us enjoy that mystery of unravelling what’s happened. One of the best things about Bloodborne is its combat and weapons and we want to see that taken even further. The original Bloodborne has combat that is fast and bold and we’d love to see gameplay additions that make it even more so. That does, of course, include some new weapons. Perhaps if Bloodborne 2 made a little more of long range weapons we could see some genuinely innovative gameplay changes. Bloodborne was a PS4 exclusive, and it was a very good one but FromSoftware isn’t a PlayStation exclusive developer. Even if it does work with them very often. In the way that Dark Souls moved onto other platforms, we’d quite like to see the same happen with Bloodborne. Having a wider audience for games like these really adds to the discussion and lore that builds up around them. If the trailer shown at the Game Awards does end up being Bloodborne 2, this is perhaps a good sign that it’ll be a multi-platform release since it was shown here rather than the PlayStation Experience which takes place in the same time frame. That does, of course, depend on this trailer being for Bloodborne 2 which we can’t confirm just yet.